Abu Dhabi is a short flight from Saudi Arabia. We had a week-long break coming up mid-semester and we knew we didn't want to travel too far from our own sandpit with Lilah. We really just wanted a place to relax and enjoy some quality family time together. Without a doubt, Abu Dhabi exceeded our expectations and it was the perfect destination for our young babe. The Grand Mosque-absolutely stunning, especially at dusk. 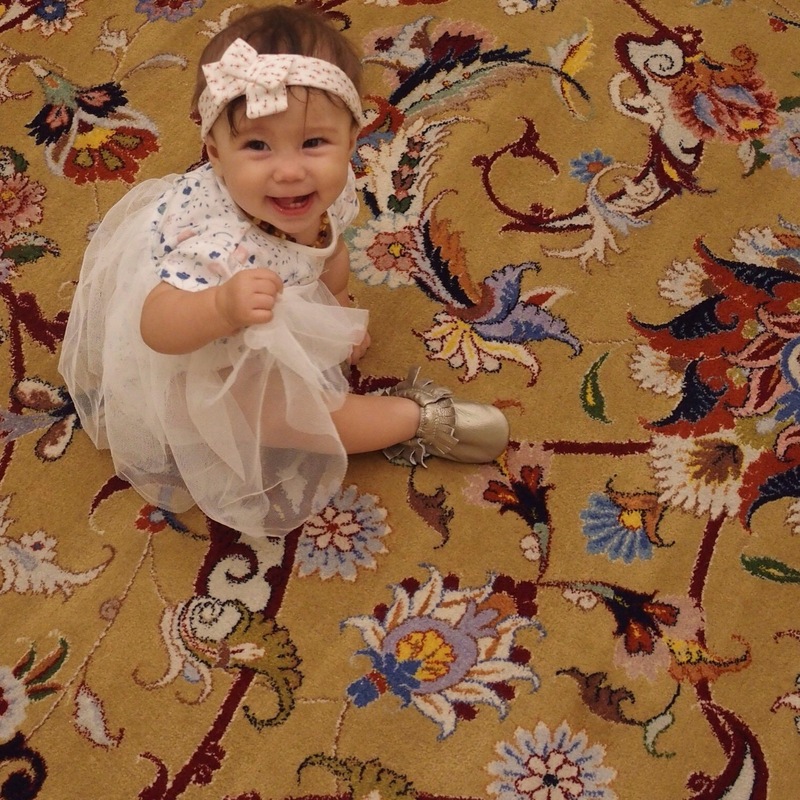 Lilah loved crawling around on the world's largest carpet. Yas Waterworld-it was here that we discovered the genius invention of the Jolly Jumper for babies in the water. We were able to relax beside Lilah as she happily jumped away. This water park is a fun day out for all ages. Take turns to try out all the rides like we did! Desert Safari-this is most popular at night but we chose to go on the mid-morning tour with Lilah. We hired a private car as well which made the experience quite pricey but you just never know what the day is going to be like with a young babe. The price included transfers from our apartment to the sand dunes near Abu Dhabi, some dune bashing, relaxing in the desert camp, and sand boarding. It was worth it! Yas Circuit formula one experience. It is not every day that you have the opportunity to drive a race car around a formula one circuit, as fast as you can go! With a professional driver in the passenger seat, it felt like being in a video game. Exciting and nerve-wracking all at once, highly recommend. Sonita and Lilah watched from the grandstand. Saadiyat Beach-clear sea water and beautiful sand. There is also an entrance fee which reduces the number of people. We can't remember the exact cost but it was worth it. A nice relaxing spot in the city. You need to cover up to enter the Grand Mosque. You can also hire an abaya there to use for a small cost. Stay for the sunset and watch the mosque light up, it is magical. There were a number of apartments on Airbnb. It was nice to live like a local in a high rise building with a mall at the bottom and a rooftop pool. It was very convenient being with Lilah to have a range of restaurants close by. The Yas Circuit opens up as a walking/jogging track on certain days. It's a place worth experiencing even if you do not want to drive on the track. 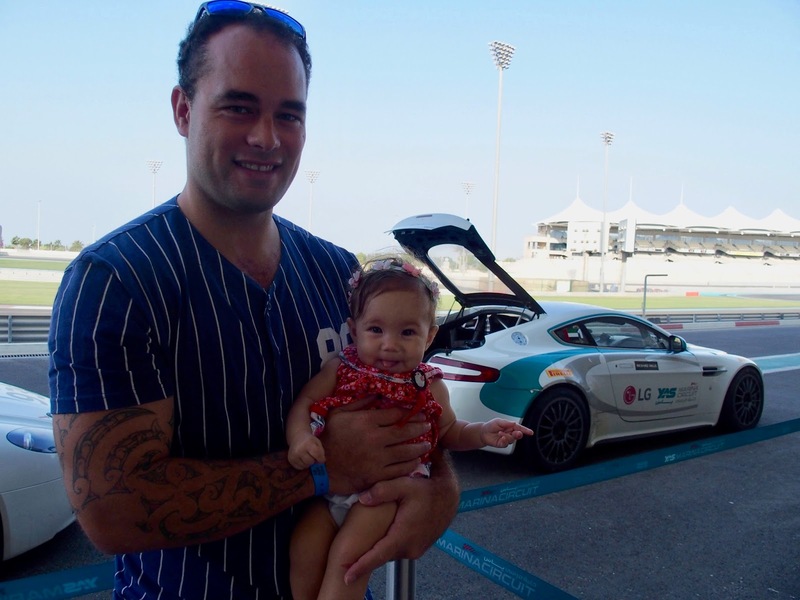 With older kids, Yas Island would be a great place to stay. With Yas mall, the marina, Waterworld, and Ferrari World, the adventures are never ending here. The Emirates Palace is a very glamorous place to visit and you can book breakfast if you fancy it. This is a nice area for a stroll along the ocean where you can admire the architecture of the buildings. Abu Dhabi is very close to Dubai so why not make a trip to both if you have time. We were able to find everything we needed for Lilah in Abu Dhabi. She really enjoyed this holiday with the beach and the water park. Our accommodation also had a pool. 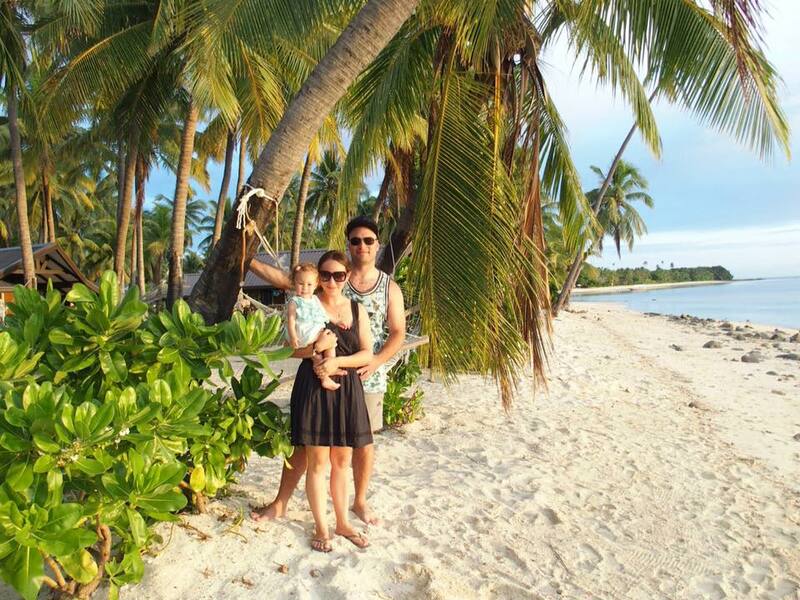 We find being near water is key when visiting these hotter destinations. Getting around Abu Dhabi for us was easiest by taxi.